« Trump starts governing, by tweet and before assuming office! That NAFTA has provided benefits for Mexico and Canada is evident. 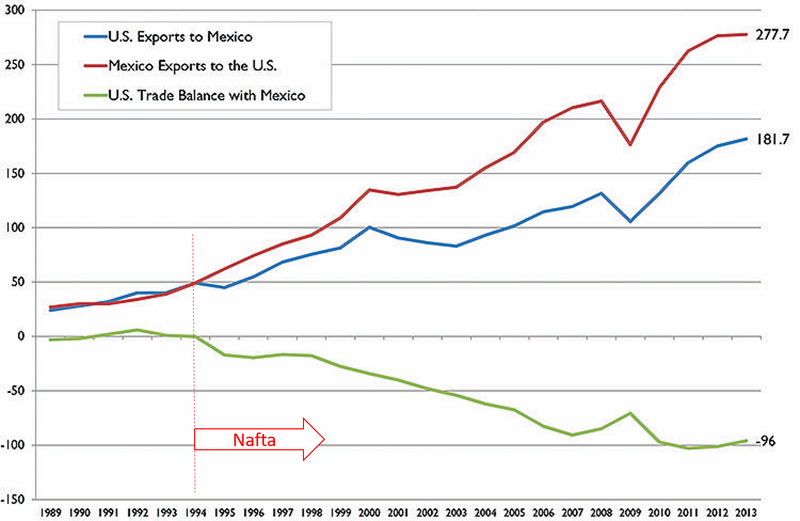 Certainly volume of trade has increased sharply since NAFTA was established in 1994. But for the US the trade deficit has also ballooned. Some US jobs have shifted to Mexico. And whether NAFTA has created any real, net benefits for the US economy is more than a little doubtful. When Donald Trump castigates US industry for shifting jobs to Mexico, he has a point. This entry was posted on January 4, 2017 at 12:08 pm and is filed under Development, Economy. You can follow any responses to this entry through the RSS 2.0 feed. Both comments and pings are currently closed.